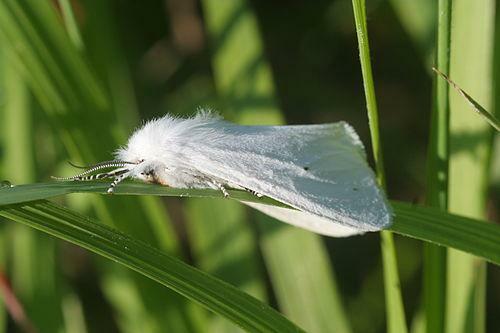 The Virginia Tiger Moth (Spilosoma virginica) is a beautiful, mostly white moth with a few black specks from the family Arctiidae. They are found throughout the United States, despite the common name. During warm weather, if you turn on a porch light, you'll often see both the male and female moths congregating at the light (along with all of the other moths that do the same thing). Sometimes, you will find female Virginia Tiger Moths during the daytime resting on surfaces where it is easy to catch them. Typically, this is because they are often about to lay eggs and are at the end of their life cycle. As a child I used to catch these and put them in a glass jar with small air holes. By the next morning there would be lots of small yellowish eggs. Unfortunately the adult moth would die because it was at the end of its life cycle. Then, a few days later, small caterpillars would hatch from the eggs, starting a new generation and life cycle. 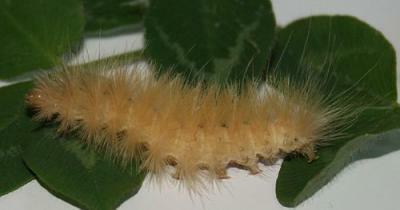 The more mature caterpillar of the virginia tiger moth is commonly known as the yellow woolly bear. The caterpillars feed on the leaves of a variety of weeds. They spin cocoons that are usually attached to leaves. They often remain in their cocoon for the winter and emerge in the spring. Image of adult tiger moth (top image) ©Alison Hunter. Photo obtained from Wikimedia Commons and published under the Creative Commons Attribution Share-alike 2.5 Generic license. 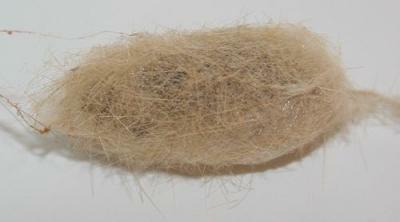 Image of virginian tiger moth caterpillar and cocoon by Megan Mccarty. Photos from Wikimedia Commons and Wikimedia Commons. Header partially made with images from the Corel Corporation. Copyright © 2008-2018 ButterfliesSite.com. All rights reserved.